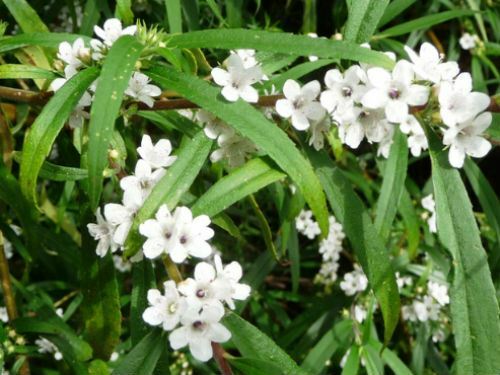 Myoporum betcheanum is a tall shrub or small tree that may reach a height of eight metres. In our cold climate garden, we keep specimens pruned to a manageable height of about three metres. Leaves are linear, up to six centimetres long and one centimetre wide. They are toothed and taper to a point. The flowers are white and 5 millimetres across. From one to eight flowers are carried in leaf axils between December and May. Globular fruits are white or brown and translucent. Myoporum betcheanum occurs on the North Coast of New South Wales and south-eastern Queensland. This species is found on the margins of wet sclerophyll forests and rainforests. Our specimens have proved to be frost hardy. All Myoporums are commonly known as Boobiallas. As with all Myoporums this species propagates readily and rapidly from cuttings. Myoporum bateae (see article) is a similar species that flowers just before M. betcheanum. Both Boobiallas could be could be cultivated together as a long-flowering screen or hedge.